Chameleon Stylists Change Lives and Hair DAILY! To paraphrase style expert Coco Chanel, “A woman who changes her hair is about to change her life.” It’s true! Ever notice that when you leave the salon … you usually have a smile on your face? That’s because Chameleon stylists are more than just that; they are therapists, ego-boosters and friends. Whether you’re behind the chair or in it, your day can be brightened by a single hair treatment. 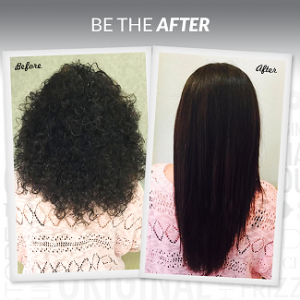 A Brazilian Blowout smoothing treatment will do much more than brighten your day, it really will change your life. Through the use of innovative and breakthrough bonding technologies, this treatment actually improves the condition of the hair by creating a protective protein layer around the hair shaft to eliminate frizz and smooth the cuticle. That means when you leave the salon, they are left with beautiful, shiny, frizz-free hair for up to 12 weeks! Pretty life changing! Every single day, our certified stylists transform and lives and hair of their clients. Make an appointment with a certified Chameleon stylist today … you aren’t just getting your hair done, you’re making an appointment to get the best hair of your life!